How do you build your school culture? Is it left to chance? As school leaders, we are so focused on strategy, curriculum and “putting out fires” that we rarely invest in the culture itself. Ignoring culture puts our school’s strategic performance at risk. We can replicate other school’s systems and strategies, but we can’t replicate culture. We must build our own. This program is designed to help your school culture become a point of difference. You will learn how to intentionally align values, behaviours, norms and systems toward a central strategy where culture becomes a force to drive results. 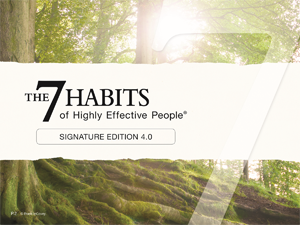 You will learn how to grasp the 7 Habits as a powerful tool for creating a great culture and model and reinforce the 7 Habits to create an operating system for effectiveness in your teams and school. You will also develop shared language for getting results. As every person learns to live the 7 Habits they will develop high levels of character and competence and ultimately, trust. Principals, deputy principals, senior leadership teams, Managers of Corporate Services, School Board Members and Teachers. Achieve results by consistently executing their resourcefulness and initiative to break through barriers. Develop an outcome-oriented mindset in the activities they engage in—projects, meetings, presentations, contributions etc. Eliminate energy and time-wasting tendencies by focusing and executing on the team’s important goals with a weekly planning cadence. Lead teams that are motivated to perform through a shared expectation and accountability process. Create an atmosphere of helpful give-and-take by taking the time to fully understand issues, and give candid and accurate feedback. Demonstrate innovative problem-solving skills by seeking out differences and new and better alternatives. Tap into the best contribution of everyone on a team by unlocking the strength, passion, capability, and spirit of everyone.